During the last four decades a number of animal-nutrition-based technologies and practices have been developed and used in developing countries, with varying degrees of success. Some technologies have produced profound beneficial effects and have been widely used; while others have shown potential on research stations but have not been taken up by farmers. To learn from these experiences, the FAO Animal Production and Health Division organised an e-conference from 1 to 30 September 2010. 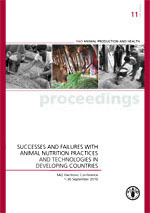 This document presents the current status of animal nutrition practices and technologies being practiced in developing countries and an analysis of the reasons for their success or failure. It also contains a synthesis paper that summarises the major issues discussed by participants and presents conclusion drawn and lessons learnt for the future. This document is expected to assist developing countries make informed decisions about the adoption of appropriate animal nutrition practices and technologies. In addition, it should also be useful for the development community, including donor agencies, to better understand, prioritize and support appropriate animal nutrition practices and technologies in developing countries. Azolla: a sustainable animal feed? Synthesis of the FAO E-Conference "Successes and failures with animal nutrition practices and technologies in developing countries"